ATTENTION 4TH GRADE TEACHERS. 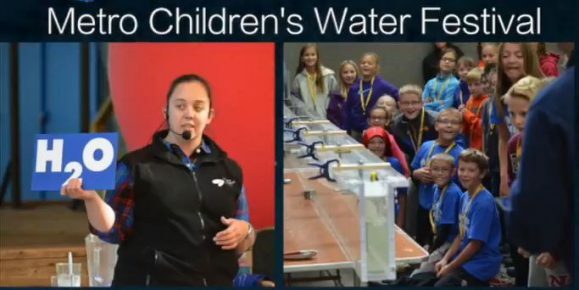 Registration is open to attend the 2019 Metro Area Children’s Water Festival that will take place on Wednesday, September 25, 2019 at the Minnesota State Fairgrounds. The Festival will include over 1,400 metropolitan area students (plus home-school students) to learn a most important lesson: WATER CONNECTS EVERYONE AND EVERYTHING ON EARTH. The purpose of the festival is to raise participants understanding of how water makes everyday life possible. Through understanding the water cycle, and its importance to natural resources, participants learn to appreciate our natural environment and apply conservation measures for sustained water resources. Classes will be selected from the Twin Cities metropolitan area. The 2019 annual Metro Area Children’s Water Festival is the 22st festival that is held on the last Wednesday of September. Over twenty-eight thousand students have attended previous festivals. Many have children of their own. The sponsors of the Festival intend to develop a metropolitan community that recognizes the importance of clean and sustainable water resources. 4th Grade Standards. This festival is geared to fourth grade students to match the Minnesota Science Standards for water lessons that are part of the education benchmarks. Parents of homeschool children are encouraged to register for the lottery drawing that is open to all 4th grade level students. To register for the 2019 Metro Children’s Water Festival please fill out the on-line Registration Form. Classes will be selected through a lottery drawing. The deadline for registration is March 15, 2019. For more information contact Bart Biernat (763-324-4207, Bart.Biernat@co.anoka.mn.us).